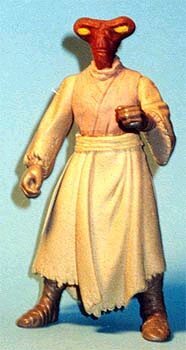 Hem Dazon was made from a Tusken Raide body and Momaw Nadon head. I cut the "hammer head" away from the "neck" of the Momaw Nadon figure. I added sculpey to the face to make the mouth. Once the sculpey cured I painted the head brown and the eyes yellow. I cut the robe of the Tusken Raider off at the belt and glued the "skirt" to the body. I then used sculpty to make the top to look like a robe or long tunic. Once the sculpey cured I painted the chest of the figure tan to match the rest of the outfit. I then glued the head to the body.